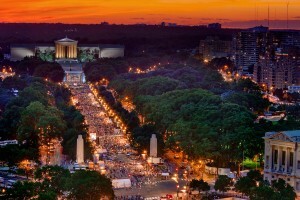 Besides being home to the Philly Cheesesteak, Philadelphia has received the reputation of being the “City of Brotherly Love.” It makes sense because it hardly feels like your typical city, but a collection of neighborhoods and squares. In fact, in the original design of the city, special consideration was put into designing squares as places for community events and residents to interact. You could say Philadelphia was designed to make new friends. Although home to fifteen four-year colleges, the city is best known for Drexel University and the University of Pennsylvania. Both of these schools are located in what’s called University City which is just on the other side of the Schuylkill River from Center City (Philly’s center). As you might guess, University City is the place for students to look first when moving to the area for school. The closer you live to University City, the higher the rents are, but if you look to some of the neighboring areas such as Dunlap and Walnut Hill, you can find some cheap apartments with all bills paid or homes for rent. Also, with SEPTA nearby, getting to school is super easy. Many relocate to Philly for better job opportunities and if you happen to be within the education or healthcare sectors, the odds are in your favor of landing a new job. Philly’s largest private employers are in these fields with notable employers such as the Children’s Hospital of Philadelphia (reviewed as one of the best children’s hospitals in the country), Thomas Jefferson University Hospital, and Independence Blue Cross. However, Philly is not just for professionals. If you are looking for art nearby, then there is no better place to go than the Avenue of the Arts which is right in the middle of Center City. Running from Locust Street to Lombard on Broad, this is where you will find many of the city’s largest theaters such as the Kimmel Center (home of the municipal Orchestra), the Academy of Music and many more. Likewise, education surrounding the arts is vast with colleges such as University of the Arts and The Art Institute of Philadelphia. As you might guess, Center City is comprised of many demographics that range from students to families and young professionals to musicians and artists. If you are apartment searching in Center City, check out a studio apartment in one of the high-rise apartment buildings to get quality living on a budget. To cut costs, try finding an apartment with utilities included for the cold winters. On the other side of the spectrum, Philadelphia is home to four major sports teams. With the Eagles, the 76ers, the Flyers and the Union (Philly’s MLA team), pretty much every season is covered for sports entertainment. Also, Philly is home to Yuengling (mostly known as Pottsville) which is the oldest brewery in the nation! Some of Philadelphia’s best and most expensive neighborhoods are right within Center City in the form of areas such as Rittenhouse, Washington, and Logan Squares. Due to the mix of upscale restaurants (you have to check out Parc Brasserie), city amenities such as the Academy of Music and the unmistakable feeling of a small town, these neighborhoods have some of the highest ratings in Philadelphia. Rittenhouse Square, in particular, is the most renown of these neighborhoods with some of the highest property values in the city. Although, the high property values make these areas notorious, there are plenty of options for those not looking to buy with houses for rent and high-rises with studio apartments. However with such high demand, finding a place may be difficult, so try using a trustworthy apartment finder - like RentLingo - (as opposed to Craigslist) to find more accurate options. If you are trying to live in Center City, but want a little more breathing room (definitely a more pet friendly area) with access to the Delaware Riverfront, consider checking out neighborhoods such as Society Hill and Queens Village. But definitely peruse Old City (found between Vine Street and Walnut Street, and Front Street to Seventh Street) since it is the city’s oldest neighborhood (go figure) and is known as America’s most historic square mile. Old City has a rich history (such as being home to Independence Hall), but continues to attract new residents with its laid back atmosphere, sidewalk cafes, art galleries, and its many eclectic lofts and luxury apartments. If you are a fan of urban chic-styled apartments for rent, Old City is the place to go. RentLingo is your trusted apartment finder in Philadelphia. We hire local experts, such as former property managers and locators to anonymously tour and consistently rate and review every available place. They share their honest and unbiased perspective with you, so you know how every rental ranks in the area. Because our experts tour every property, we can offer consistent apartment ratings across every region. So unlike finding a Backpage or Craigslist rental, you can trust these apartments are verified and trustworthy: whether it's a cheap studio or a one bedroom with all utilities paid all the way up to a nice house for rent or a luxury condo.